There are two kinds of events in life: those we can prevent and those we can only prepare for. Now that we’ve colored this survival kits review in prepping tones, let’s start “repairing that roof” while the sun is still shining. It’s always better to prepare or prevent than to be left to repair and repent. Keeping that in mind, proper survival kits definitely put you in a place where luck can find you. Amidst collapsing infrastructure, cut off communications, and natural forces having their way with your surroundings, a little luck goes a long way. Short of casting Hermione’s undetectable extension charm on our BOBs, we can never pre-pack for everything that can go wrong in life. That’s why it’s so important to choose the right survival kit and cover as much ground as possible. How We Chose The Best Survival Kits? The survival kits that climbed our list are the top of the heap, made of budget-friendly choices. Prepping preaches a life beneath our financial potential. Speaking of which, these products offer a resounding bang for the buck. Prepping is a marathon, not a sprint (ideally), to use a cliché. It’s a slow process of acquiring relevant skills primarily and thinking about your stash later. Therefore, this survival kits review fixates on products that’ll leave more than just moths in your wallet. This is one of best survival kits available. Except for food, that is. 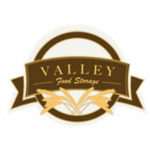 You will get all the tools you can think of, but the food supply will have to come from somewhere else. The lack of any filler tools is very good to see. 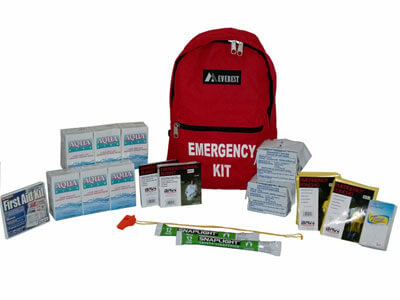 Everything in this survival kit is 100% useful in case of an emergency. Companies all too often try to jack up the price by including a bunch of no-good, cheap tools; fortunately, this is not the case with this kit. Shipping is 100% free for all domestic orders within the USA. The order usually ships within 48 hrs, followed by an e-mail with your tracking number. The kit holds: a dynamo flashlight, a 2-man tent, 2 sleeping bags, 2 rain ponchos, 12 water pouches (4.2 oz), 2 x 8 hrs hand warmer, knife and pliers, hand saw, duct tape, 2 x light stick, 5-in-1 whistle, bottle for water filtration, 50 ft of rope, and heavy-duty gloves, among other items. The first aid kit contains 60 pieces: bandages, alcohol pads, antiseptic towelettes, butterfly closures, N95 breathing mask, ice pack, and iodine pad, to name a few items. There’s also a dedicated pack, containing the essentials for male/female hygiene purposes. The emergency bucket, unlike its predecessor, offers food as well. The shelf life of the perishables is 5 years. Survival Frog offers to monitor the expiration date of your purchased food and alert you when it’s about to expire. Food and water upgrades can be purchased for extra days of potential sustenance. Customization add-ons can even broaden the emergency kit to another person(s). Another benefit of this kit is the ability to purchase its “refresher.” It’s designed to replace anything perishable within the bucket kit, without buying another one. It’s basically a zip bag packed with food, light sticks, water purification tablets, and a 66-piece first aid kit. The “main” thing encompasses: food bars worth 3600 kcal (we would prefer to see 4800, but hey), emergency Aqua Blox drinking water, 16.9 oz per day, dynamo flashlight and radio, mylar blankets, dust masks, 66-piece first aid kit, multi-tool, light sticks, ponchos, 50 ft of rope, work gloves, waterproof matches, duct tape, a tent, toilet chemicals and bags, a can opener, etc. 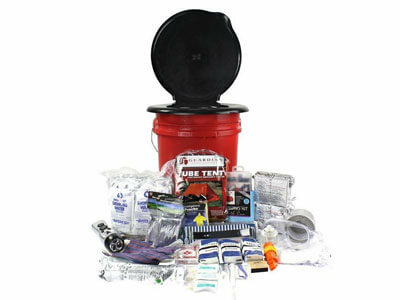 You can invest an additional 17.97$ in your survival kit for a toilet seat accessory and use the bucket container as a portable restroom. 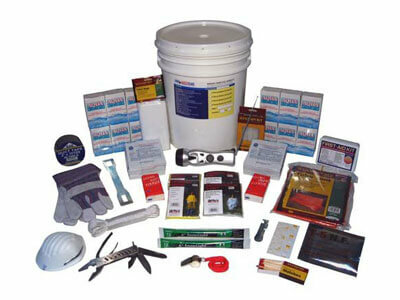 Like its “bigger cousin,” this Survival Frog kit can serve many purposes in a survival situation. It is your food and water source, an impromptu tool shed, and a restroom, if need be. Unlike the said cousin, this Guardian bucket offers 4800 kcal worth of energy bars, but cuts on water-purifying tablets. The golden standard is 20, this survival kit features only 10 of them. As far as shelter and warmth go, the offer is pretty regular. You’ll have available a tent, mylar reflective blankets, and plastic hooded ponchos. The light and communication segment begins with a 4-in-1 dynamo mix between a flashlight and a radio, 5-in-1 whistle, emergency 30-hour candle, green glow sticks good for 12 hrs, and waterproof matches. Survival tools per se go as follows: Blue tarp, 7 x 5 ft, ideal for ground or tent cover, solid steel pry bar (7″ x ½”), intended to be used as a multi-tool, rugged 16-function army knife, duct tape, a pair of leather-palm work gloves for blister prevention, sewing kit, plastic safety goggles, and N95 dust mask. The kit also includes a rich supply of hygiene and first aid supplies. We are back to 3600 kcal total, coming from emergency food bars. You’ll also get 18 water pouches. Since they use Datrex pouches, the overall quantity is 18 x 4.2 oz or 1245ml. The backpack itself being dark blue shouldn’t attract all that much unwanted attention. The orange parts definitely don’t help, though. Besides the usual preparedness fluff, we don’t get all that much info about the product, something a lot of companies dealing in survival gear should change post haste. 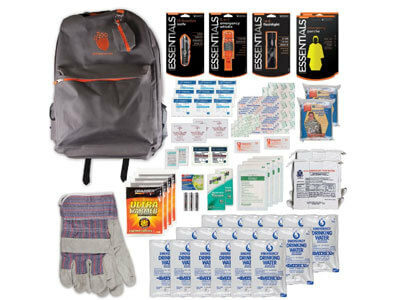 Alongside the already mentioned food bars and Datrex pouches, the kit also contains 4 hand & body warmers, emergency hooded poncho, matches, 5-in-1 whistle, 2 packs of tissues, a knife with 13 functions, 41-piece first aid kit, 3 AAA battery, LED flashlight, and a pair of work gloves. The picture on the site also mentioned blankets, but they’re not present in the general product description. Maybe they considered blankets and body warmers to be the same thing, it’s anybody’s guess. All in all, this is a pretty affordable little emergency kit; nothing flashy, but it’ll get the job done. This is a pretty confusing product, to be honest. Not in terms of quality or assortment, but regarding the amount of people it can sustain for 72 hrs. The official title says 2-person, but their description says 4. The description intro says “4 of everything,” the bullet points say 2. It’s a rather tricky puzzle and not the kind you want solved the moment the kit arrives at your doorstep. So, we can definitely “disperse the fog of war” on this one and say it’s a 2-person pack for 72 hours. It’s a budget option, for sure, but this survival kits review was envisioned as a budget guide anyway. The pack features: 4800 kcal in food bars and 6 packets of water, 2 lightsticks with 12 hrs of juice, 2 ponchos and survival blankets, 2 dust masks and pairs of nitrile gloves, a whistle, and a 33-piece first aid kit. This emergency kit is smaller than the previous ones mentioned, so it’s also more portable and doesn’t take up too much space, wherever you decide to store it. William Butler Yeats said that life was just a long preparation for something that’ll never come. If you agree with this quote, first congratulations on the ability to ignore evident facts, second, this was not an article for you. If you, however, realize that the increase in calamities such as natural disasters, power outages, terrorist attacks, and economic collapses is very real, then you’ll find this guide more than helpful. 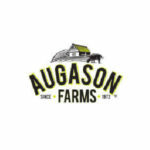 The products presented are some of the most budget-friendly options on the market. They are a good balance between economy and quality. You should never sacrifice the latter in favor of the former. You are offered a good mix of basic survival tools like knives, pliers, lightsticks and flashlights, whistles, blankets, tents, ponchos, gloves, masks, and food items mostly embodies in high-calorie energy bars and water pouches and/or packets. 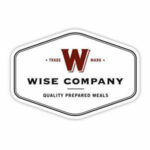 The shelf life of the food items is usually somewhere around 5 years and some companies offer replacements after that time without having to buy the rest of the kit. We wish you many replacements in the future. 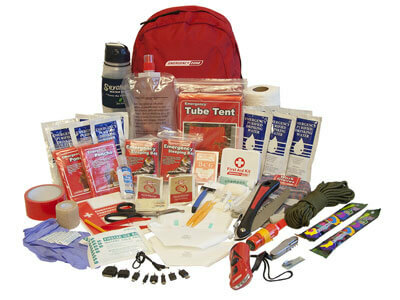 Personal hygiene products and first aid kits are also on the menu and equally as represented within every survival kit. The number of pieces varies from one product to the other, but they all have the “bear bones” required for giving immediate medical attention and keeping yourself clean. Us preppers know bad things are coming and going all the time. Be that as it may, let’s remember the beginning of this survival kit review and choose to prepare and prevent rather than repair and repent.